Friday 30th January was indeed a landmark in the history of Richmount Primary School with the official opening of the new multi-purpose hall and classroom. 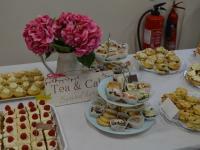 The opening was performed by Dame Mary Peters CH DBE RNR, who had very kindly agreed to fulfil this function. 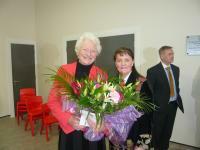 Dame Mary was welcomed by the Chair of Governors, Mrs. Deirdre Kennedy. Also in attendance was Mr. Plunkett Campbell (Chairperson SELB), along with representatives from the SELB architects and planning department, Bryson Architects and Bradley Construction. In a short speech the Principal Mr. Hall thanked the SELB for providing the capital investment necessary to provide this new facility. He also personally thanked the entire team of architects, SELB colleagues and builders who had worked tirelessly throughout the building programme for their hard work, co-operation and patience. Mr. Hall then directed his words towards Dame Mary, as guest speaker. He congratulated her on her most recent award of Companion of Honour bestowed upon her by Her Majesty the Queen. 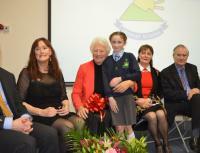 Mr. Hall then thanked Dame Mary for being such a super role model and ambassador for all of us in Northern Ireland. Finally he produced a copy of the Portadown News, dated 29th September 1972, which reported Mary’s triumphant return to Portadown following her success at the Munich Olympics. 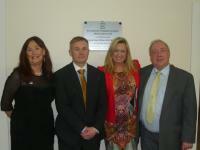 Dame Mary then cut a ribbon and unveiled a plaque, declaring the new multi-purpose hall open. To assist her Dame Mary, of her own volition, enlisted the help of P7 pupil Hannah Cochrane, whose photograph Mary had noticed in this week’s Portadown Times. Hannah had been pictured having just qualified for the Northern Ireland cross country finals. 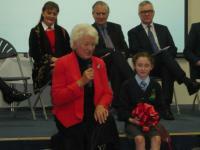 Dame Mary spoke to all of the pupils in a very relaxed manner, regarding her athletics career, her childhood and impressed upon everyone the need for a healthy lifestyle and the need for exercise, regardless of age. For the large crowd of pupils, parents and friends in attendance, Dame Mary’s visit to Richmount will certainly live long in the memory. Photograph 5 shows Dame Mary addressing the audience. 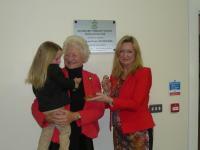 Dame Mary unveiling the new plaque. Dame Mary cutting the ribbon. 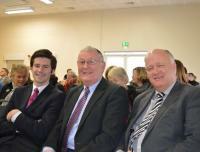 Pupils Tom and Ronnie Harland along with Mr. Hall (Principal) and Dame Mary. They are posing with a copy of the Poratdown News dated Friday 29th September 1972 which recorded Mary’s triumphant return to Poradown following her success in Munich. As part of the ongoing work at Richmount Primary School, a new classroom is being constructed and is due for completion just before Christmas 2014. Miss Haslam and her P2 class cannot wait to move into this new room as they are currently using the school library. 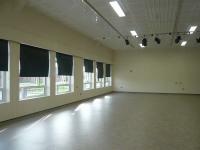 The entire school community was delighted when we took possession of our new multi-purpose hall on Monday 15th September 2014. 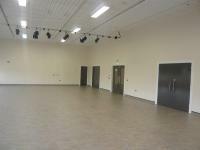 We now have a facility that is fit for purpose and can accommodate school dinners, P.E etc. The new build also offers much needed storage and through the funds allotted by the SELB I have been able to purchase staffing, chairs and a data projection system. We have now resorted to having one break and lunchtime that has reduced disruption to teaching time. Now that the hall is completed the builders are concentrating their efforts on building the new classroom that will accommodate Miss Haslam’s P2 class. 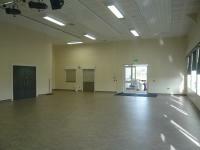 This work is due to be completed prior to the Christmas holidays and P2 will be using the room from January onwards. I would like to thank all of our parents for their support and patience thus far with any disruption they have experienced. The new hall and classroom will be formally opened at a date to be decided in the New Year.